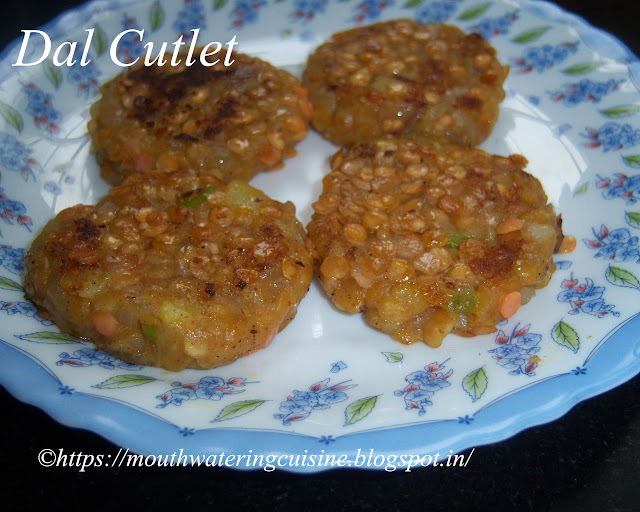 Dal Cutlet -- is a very simple and easy snack item. I like anything which is healthy and less calorific food. I love to prepare them as and when I came to know about them. When I found it in a magazine long back, I cooked the dal and made it messy as it was given in the recipe. After a long gap, when I was going through my old recipe collection I stumble upon this once again. But this time I altered the way it was given by not cooking the dal but soaking it. They turned out to wonderful cutlets. All of them liked them very much. Dal Cutlet -- cutlets made with masoor dal. Soak masoor dal for 2 to 3 hours. Drain excess water and put it in a colander. Chop onions and green chhillies. Heat oil in a Kadai, add chopped onions and green chillies. Saute them till they become translucent. Keep some portion of the dal separately and add remaining dal to the fried onions. Saute well, add salt, turmeric powder, chilli powder, coriander powder, garam masala and aamchur powder. Mix well, allow this to cook for a while or till the dal becomes soft. If needed sprinkle some water, remember if necessary only. Add mashed potatoes to it and mix well, turn it into stiff and dough like consistency. Make small patties and stick the dal on both sides to it, which we kept earlier. Make three or four patties or cutlets like this. Heat tawa in low to medium flame. Cook the prepared cutlets on it. Add little oil one one side and cook for 2 minutes and turn it and cook for another minute while applying oil to it. Once done remove them from fire and repeat the same with the remaining dough. Serve them hot with little sauce any time. For more snakcs click here.Thank you for visiting my blog. Hope you liked all my recipes. Any feedback and comments are appreciated.